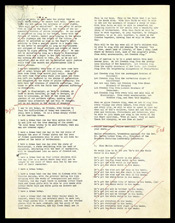 (by Melanie Eversley, USAToday.com) – There is the handwritten draft, complete with cross-outs, of Martin Luther King Jr.’s acceptance speech for the 1964 Nobel Peace Prize. There are the notes about the ending of King’s iconic I Have a Dream speech. And there are the charming letters he received from children. These and other King papers – 200,000 documents in all – [became] available online for the first time [Monday], as the nation marked Martin Luther King Day. The King Center Imaging Project, financed and overseen by JPMorgan Chase, offers free public access to the papers at: TheKingCenter.org/archive. The project came about after Martin Luther King III contacted Chase about preserving the documents, said Chase’s Ali Marano, project facilitator. AT&T Business Solutions and EMC also contributed. For the past nine months, 300 Chase staff members, college students and veterans hired by the company, and 100 volunteers from around the world have sorted through boxes of personal papers, documents and handwritten notes. They have taken digital images of each one, indexed them and stored them in acid-free containers with bar codes. “What’s exciting is we’re not just bringing his story into perspective; we’re offering a really relevant point of view that can impact future generations,” Marano said. In putting together the project, Chase consulted with people such as King aide Andrew Young; Clayborne Carson, director of the Martin Luther King Jr. Research and Education Institute at Stanford University; and Kingian scholars at Morehouse College, King’s alma mater, Marano said. The work has involved two shifts of 25 people each attending to each document. Staff and volunteers wear lab jackets and Latex gloves to prevent perfume or oils from damaging the papers, said Janella Thomas, a junior economics major at Spelman College. …..
Reprinted here for educational purposes only. May not be reproduced on other websites without permission from USA Today. Visit the website at USAToday.com. 1. Who had the idea to put Dr. Martin Luther King Jr.’s papers online? 2. How did this idea become a reality? 3. How many of Dr. King’s documents will be available online? 4. Where had the papers been stored until they were made available online through The King Center Imaging Project? 5. Why is it important to every American to have available Dr. King’s original documents/papers online? Visit the King Center website at: thekingcenter.org. Read about Dr. King’s 1964 Nobel Peace Prize at: nobelprize.org/nobel_prizes/peace/laureates/1964/king-bio.html. Visit the website at: mlkmemorial.org. Read about an incorrect to be removed from Dr. King’s memorial in Washington D.C. at: cbsnews.